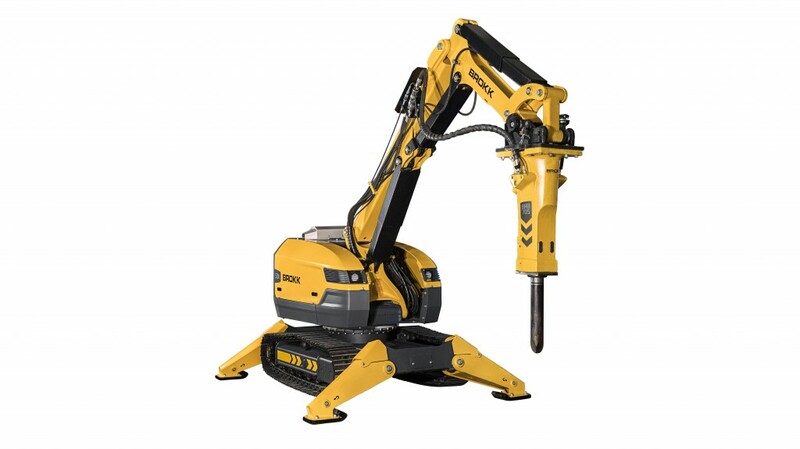 The Brokk 520D is one of four new next generation Brokk remote-controlled demolition machines Brokk is highlighting at World of Concrete 2019 at booth C4249 in Las Vegas. The Brokk 520D is the only diesel model out of the company's four new next generation remote-controlled demolition machines. Like the other next generation models, the 520D features Brokk's new SmartConcept system, including the SmartDesign and SmartRemote. SmartDesign extends machine life and provides unprecedented ease of maintenance due to 70 percent fewer cables as well as hardened components, LED headlights and easily accessible grease points and hydraulic hoses. An ergonomic remote-control box, the SmartRemote, incorporates adjustable straps, intuitive controls and professional-grade radio technology with a 984-foot (300-metre) working range. The 520D delivers 1,086 foot-pounds (1,472 joules) with each blow of its 1,510-pound (685-kilogram) BHB 705 hydraulic breaker. Its three-part arm extends to 23 feet (7 metres) vertically and 22 feet (6.7 metres) horizontally. It also rotates 360 degrees, giving operators optimal flexibility to reach nearly anywhere in one movement. A heavy-duty boom system and increased hydraulics allow the diesel-powered machine to handle the same range of heavier, more powerful attachments including those available for the electric Brokk 500, released last year. This includes beam grapples, drum cutters, shotcrete nozzles, drills, planers, sorting grapples, demolition and scoop buckets, metal shears, clamshell buckets, concrete crushers and rock splitters.